Trump believes he will never experience an accident, diagnosis, or any indignities related to age. He thinks his money will insulate him from chaos, from these eventualities. One is left to wonder how he will look back on his recent antics and regret them. The title says it all. Donald Trump’s book Crippled America: How to Make America Great Again is, like most of his tirades, offensive and stupid (as is the title “President Trump,” as Stephen Colbert so aptly noted). 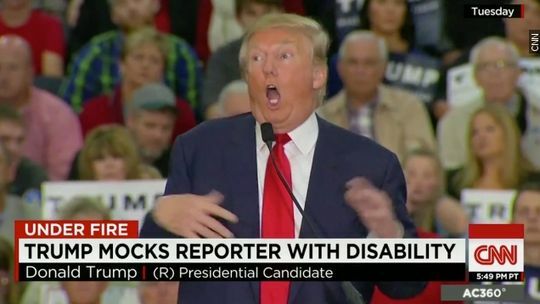 However, as a person with a lifelong disability, I wasn’t surprised that Trump got away with it, or that the inference made is that people with disabilities are not so great. One only needs to type TRUMP into a Google search engine to read the recent controversy over his outrageous, schoolyard antics related to an accomplished reporter with a disability, openly mocking how he walked and moved. Even more disturbing were the cheering throngs of people who think making fun of people with disabilities is not only appropriate, but truly funny. It was a crippling blow to the economy. I am paralyzed with fear/grief/sadness/other terrible emotion. The Disabled (picture the Barbarian Horde, a combination of zombies from the Walking Dead and a few Lord of the Rings characters wearing nothing but loin cloths and with mysterious substance oozing from one or both eyes). This one is a special favorite of newscasters. Do not tamper with, disable, or destroy the lavatory smoke detector. I hear (and sometimes say, to my horror) these phrases also; they are deeply ingrained in our vernacular; they fly off the tongue. But isn’t that the whole point of the offensive epithet, that we say it unconsciously, meaning we don’t think about what our words truly mean or we just don’t care? Case in point: My grandmother, when I told her she was under no uncertain terms to ever say “Jew them down” or “those niggers,” in my presence, that she had to keep her anti-Semitism and racism out of the room when I was around, and that she would do well to think about not saying those things ever, or even thinking them, countered by saying “that’s how we talked about them when I was a kid.” That, I told her, was not an excuse, and I would eventually run screaming from the room. She didn’t get it. This is the same woman who told me the moment I hit puberty that no man would ever want me because I had a disability, and that it was a good thing I was smart, because at least I could support myself. To her, my disability was a disaster. She also complained about being asked to give money to build an elevator at her church. Her logic? She didn’t use a wheelchair, so why should she pay for others? “They should just stay home,” she said. She really didn’t get it. Neither does Trump. Sadly, he’s not saying anything new; in fact he’s giving voice to deeply entrenched attitudes and familiar ideas about the abilities (or lack thereof) of people with disabilities, as evidenced by the following interactions that I, out of no choice of my own, participate in nearly every day, while I’m walking around, ordering coffee, shopping, or working out. “What happened to you/What’s wrong with you/Why are you limping?” (Translation: Your body is wrong if it’s not moving in the way in which everyone else’s moves in the world. What gives?). “You’re brave; I’m proud of you; you’re an inspiration; if you can work out there is no excuse for me.” Or there will be a story on the news, this time those same newscasters speaking in breathless awe about a disabled athlete who “overcame” their disability and allowed no impediment to stop their scaling of an enormous mountain. Everyone is an accident, a disease, a war injury, or a decade away from having a disability. Yes, everyone. Even if you’re fit, vegan, a yogi. Even if you’re rich. Even if you’re young. Even if you walk around feeling lucky that you are temporarily able-bodied. It bears repeating: EVERYONE will have a disability if they live long enough. That Trump titled his book Crippled America is shocking, yes; that he made fun of someone with a disability is horrible, of course; but his book title and his recent statements reflect what people truly believe about bodies that fall out of the ridiculous normative standards we swallow and accept without equivocation: They’re far from great, and that’s being generous. In a more sinister interpretation, they are useless. So if we’re not wanted, then what? Will our world become like that in a Margaret Atwood short story, a nursing home burned to the ground because the younger members of society have decided that if you’re old you’re so irrelevant you might as well die? We can laugh at Trump (and must sometimes, I believe, or we won’t be able to get out of bed in the morning) but his ideologies put into concrete action would be truly disastrous for many groups of people, not just people with disabilities (as in, anyone who is not a white male who makes more than six figures; anyone who isn’t straight and Christian; anyone who thinks that socialism is a disease you can catch by applying for a passport and/or visiting a Scandinavian country). His attitude and his thinking about people with disabilities and other “unwanted” groups has consequences, and it has terrifying but real roots in other ideologies that wanted to make the world look and be a singular way. You can look at a roomful of prosthetic limbs at the Holocaust Museum in Washington, D.C., and wonder to whom they were once attached, or what those people might have done in the world had they been allowed to live, if you’d like a reminder. You can look at a long history of hate, and genocide, and annihilation, and the promise that NEVER AGAIN would such atrocities happen. Trump believes he will never age, have a stroke, or be in a wheelchair. He thinks he will never experience an accident, diagnosis, or any indignities related to age. He thinks his money will insulate him from chaos, from these eventualities. One is left to wonder how he will look back on his recent antics and regret them. Here, perhaps, is where we can find compassion for him, but it’s a struggle. In No Pity, the generous, fantastically researched comprehensive history of the disability rights movement by Joseph Shapiro, we are reminded that “medicine once promised to wipe out disability by finding cures.” As in: wipe them out. As in: keep them out. As in: build a wall. As in: burn the books. It’s not just semantics, and Trump’s not just a blundering idiot. He thinks he has the cure to what ails us, and people are listening. People are paying attention. Listen—or refuse to—at your own peril.